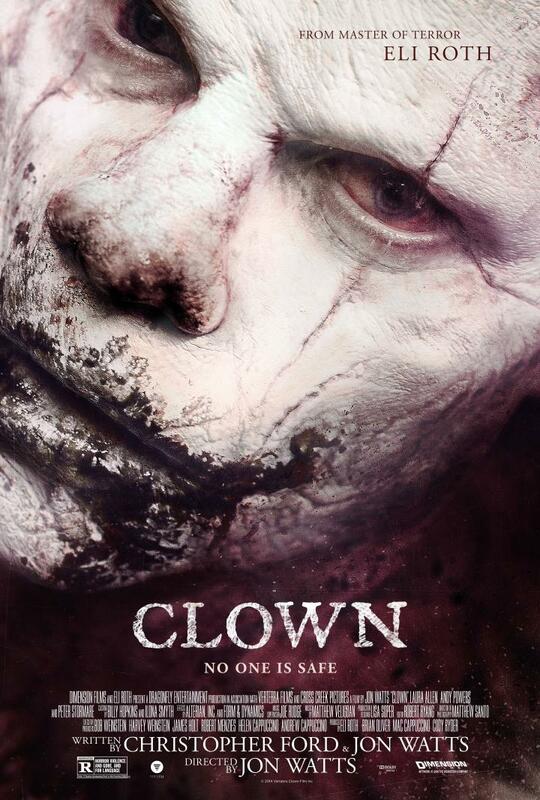 Tag line: "The kids aren't alright"
Trivia: Movie posters featuring the clown were censored in Italy for being "too scary"
Before it was a movie, Clown was a mock trailer created by first-time director Jon Watts, who had some fun with it by claiming the phony film was “produced by horror master Eli Roth”. Calling it a “ballsy” move, Roth (who had never met Watts) decided to actually get involved (as producer), giving the young filmmaker a chance to turn his short into a feature length motion picture. And as killer clown movies go, this one’s a doozy! When the clown hired to perform at his son Jack’s (Christian Distefano) birthday party cancels at the last minute, real estate agent Kent McCoy (Andy Powers) takes matters into his own hands by donning a clown suit he found in the basement of one of the houses he’s trying to unload. Calling himself Dummo the Clown, Kent spends the afternoon entertaining Jack and his friends, but when the time comes for him to remove the suit, he finds he’s unable to do so. Aided by his wife Meg (Laura Allen), Kent tries desperately to shed the clown costume, but to no avail. Anxious to find out what’s going on, Kent contacts Herbert Karlsson (Peter Stormare), whose late brother owned the house in which he found the clown suit. But according to Karlsson, it isn’t a suit at all: it’s the skin of an ancient demon from Northern Europe known as the Cloyne. Legend has it the Cloyne was an evil entity who, to satisfy his hunger, devoured five children every year. Now that he’s put the skin on, Kent is becoming the Cloyne, and the only way he can rid himself of this malevolent spirit is to kill five kids and eat their remains. Will Kent resort to murder, or will he instead take Karlsson’s advice and commit suicide before it’s too late? Eli Roth is no stranger to mock trailers; he directed the entertaining Thanksgiving promo for the Tarantino / Rodriguez mash-up, Grindhouse, one of several fake trailers that played during that 2007 movie. Much to my chagrin, Thanksgiving, a loving tribute to ‘80s slasher flicks, has yet to be expanded into a feature film, but over the years a few mock trailers have made the transition from fantasy to reality, including Hobo With a Shotgun and Machete, both of which were as over-the-top as their uber-violent “trailers”. Clown is different in that it’s more serious-minded. Sure, it has its comedic moments (especially early on, when Kent realizes he can’t get the suit off, and has to walk around in public wearing it), but it tempers the laughs with some genuinely chilling scenes (the last 20-30 minutes of Clown are pretty intense). While its story would have easily lent itself to a flamboyant interpretation, Watts opted to keep things more focused, and the resulting movie was all the better for it. In addition, Clown features a strong performance by Andy Powers as the loving father who accidentally awakens a demon from its slumber. From the moment we meet him, we like Kent, and while he’s clearly not respected by his father-in-law, Walt (Chuck Shamata), or other members of Meg’s family (who criticize his every move, treating Kent as if he was… dare I say… a clown), he is a good husband and father, willing to do whatever is necessary to make his wife and son happy. But as the demon emerges, Kent transforms before our eyes into a creature capable of doing terrible things. Kent tries his damnedest to resist these urges, and later on, when the Cloyne has taken full control of him, we sense there’s still a bit of the old Kent left inside, fighting to break free. As a result, we’re never quite sure what’s going to happen from scene to scene, and it’s to Powers’ credit that the everyman Kent is as formidable a personality as the centuries-old evil that possesses him. This, combined with a solid supporting cast and some very disturbing sequences (you may never look at a Chuck E. Cheese restaurant the same way again), helped make this 2014 film one of the best clown-themed horror movies I’ve ever seen.